The grey partridge is a game bird of the Pheasant family. 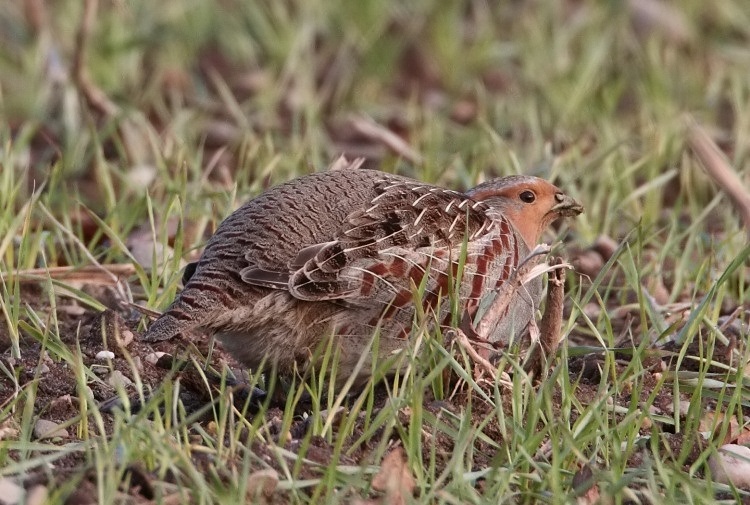 This Partridge is also popular worldwide as English Partridge. 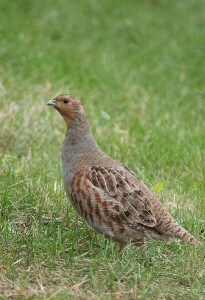 They are quite smaller than both Pheasants and Red legged partridges, but are bigger than the Quails. These birds are originally of temperate step grasslands. Grey partridge is strictly a ground bird and are not found in pear trees. They are been introduced widely in North America. 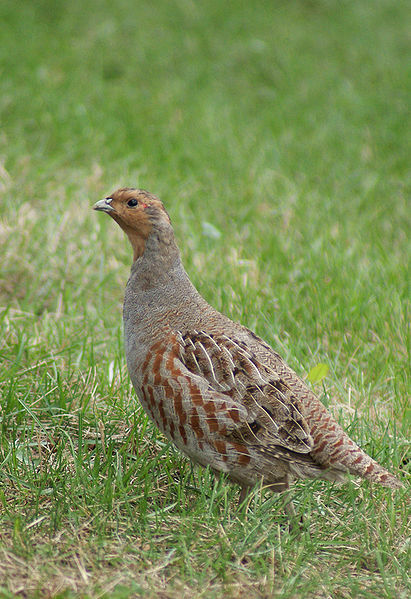 They are also known as English Partridge and Hungarian partridge. This species of birds are mostly seen in areas covered with tussocky grass margins. 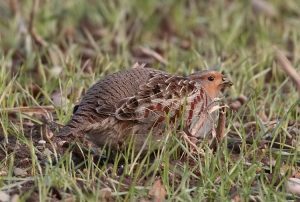 Both the sexes looks same but the only difference is the cross of Lorraine on the territory covers of female partridges. This bird looks like a stray pigeon from a distance. 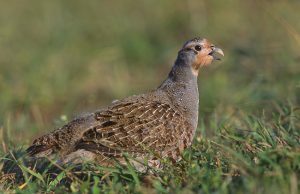 Size : Grey partridge grows to 28-32 cm in length. Shape : This bird is roundish in shape. Weight : Both the sexes weigh 390gm-400gm. Color : The belly is white in color and is marked with horse shoe marks in both the sexes. Wingspan : Their wingspan stretches up to 46 cm. The wings are round shaped. Bill : The bird possesses a thick but short bill. Eyes : Their eyes are brown and are surrounded by faint, red eye ring. Tail : partridge has short neck and tail. This species of game-bird were introduced from Eurasia. Decrease in cereal production resulted in their decline. The decline was so serious that in 1930 wild birds from abroad were released and prohibiting the shooting of partridge was introduced. It was from the year 1933, that increase in their growth rate was seen. This species of birds had colonised areas in Ireland where they was unknown some 20 years back. This particular species of bird breeds on farmland across Europe, Asia, North America, Canada and United States. They are actually non-native species and were introduced to North America. Now they are seen in almost all parts of the world. Grey partridge are mainly sedentary. Some of them migrate and that also because of unsuitable weather conditions. They prefer residing in cultivated areas, steppes as well as grasslands in temperate zones. They actually need ground cover such as shrubby areas and hedgerows from where they flush when being disturbed. They love wandering in open areas and has also adapted to the changes for agricultural expansion. Grey partridge possesses unique behavioral characteristics. They are non-territorial in nature. They live in large groups. Males become aggressive towards each other during the mating season. 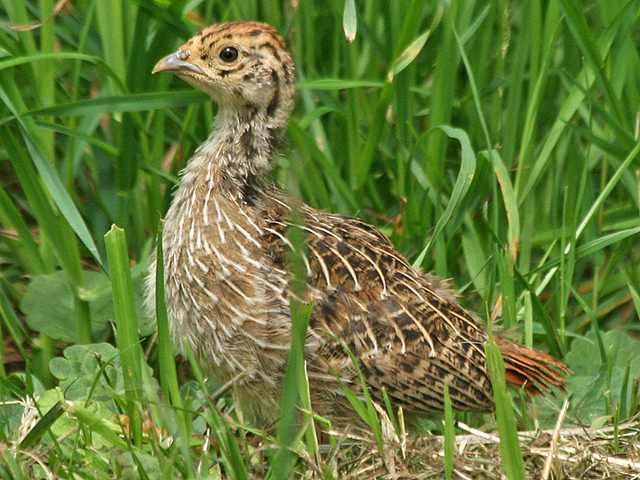 In the month of summer, partridges consume insects and green leaves. In winter, they consume variety of waste grain, sunflower and wheat. During their courtship days, the male spread wings and tail to display their rich plumage pattern. 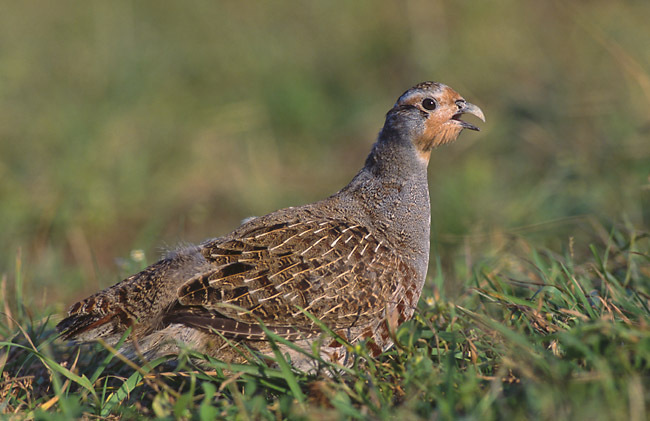 Grey partridge feeds on seeds of weeds and cereals as well as grass leaves. They also catch insects like bugs, aphids, Hemiptera, and some larger bugs, beetles and so on. Most of their diet chart comprises of grains. Partridge sport strong and fast flight on short distances. Their flight is buzzing with frequent glides. They call on takeoff. Sometimes at night they sing but that is also short and clipped. They do have many predators that include foxes, rats, magpies, stoats, as well as crows. Grey partridge is a bird having some of the best adaptive features. They prefer open grasslands and so have adapted to live on farmland. They live in groups so that can defend the predators. They prefer seed eating and so grassland serves as the ideal spot for them. If are threatened, they flies often calling rick rick rick as it rises. The mating season varies according to their range. But mostly the mating starts from the month of April and continues till June, with a second clutch in late summer. Grey partridge are monogamous. They start forming pair four months before breeding. Both mates join in the breeding season. Their nest is placed in the dense vegetation and is sometime placed at the base of hedgerow or bush. The female birds lay between 15-17 olive eggs. Females incubate the eggs for last 20-25 days. Male ones protect the nests. They are precocial and leave the nest within 1 year after hatching. Grey Partridge nests on ground in circumvent bottoms, mallet banks, nettle beds, cereals and game cover. They cover their nests with dead tussocky grass that makes the nests look attractive. They used to have a life span of 3 years and some stays for 5 years and not more than that. IUCN has enlisted these birds in the least concerned category. They are not threatened but still their population is declining. Efforts are being made by some organizations to halt this decline rate. In Ireland, this bird is virtually confined to the Lough Boora reserve in County Offaly. They are most active in dawn and dusk. 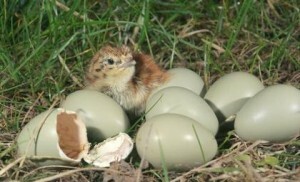 A partridge’s eggs take less than 3 weeks to hatch. These birds prefer walking rather than flying. They are gregarious in nature. Grey partridge chicks require a diet of over 90%insects. They have been introduced to many parts of the world for hunting.